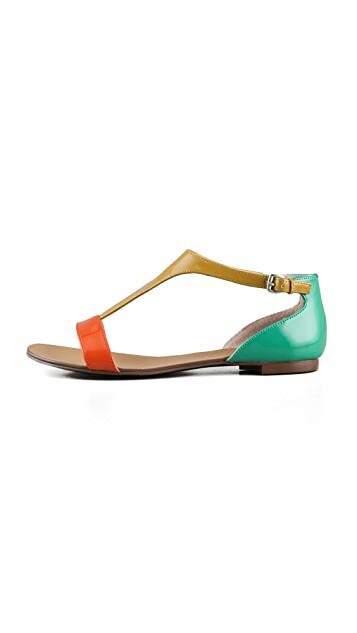 These tri-color faux patent leather T-strap sandals feature a buckled ankle strap. Rubber sole. I read the sizing reviews for these before I ordered and I'm glad I did as they fit perfect!! I just received them today and I am freakin excited! definitely will wear this summer. fitting is just right. material doesnt look cheap at all. absolutely love them. it is a must buy. seriously, it is affordable, what more can you ask for?! These sandals are great. The multicolor goes with so many of my outfits. They were great walking sandals. The only thing was the heel of the sandal was so high on the back of my ankle and so stiff, that it dug into the top of my heel and dug into my skin. I'm going to put moleskin there to see if i can avoid this the next time I wear it. The shoes are very cute! I'm usually a 6.5, and the size 6 fit fine. The back chafes at my heel a little bit, but hopefully as the shoes break in that will stop. 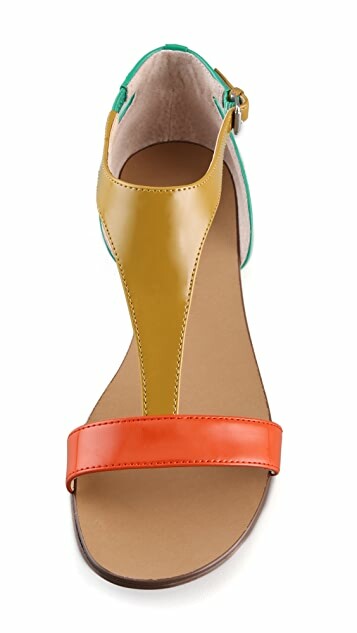 I love the trio of colors (I ordered the style in teal, orange, and darkish yellow). They look great with denim in a dark wash. Consider ordering a half size down. I love this shoe. I've recently had knee reconstructive surgery so am not able to wear my heels for a year. 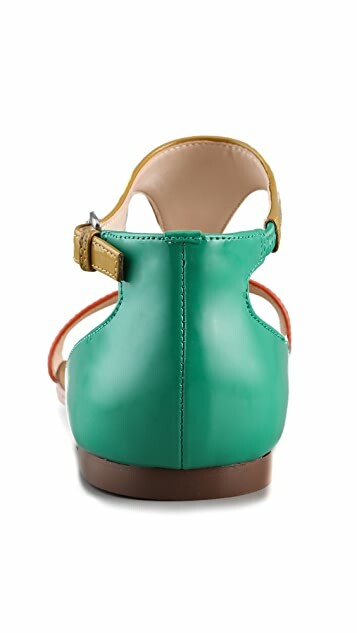 Have been buying flat sandals from shopbop to match my wardrobe and have had so many comments on these shoes. Perfect size, really comfortable and goes with most of my wardrobe. The colors are beautiful and easy to wear with everything. However, the shoes do run large. My feet keep sliding forward while walking which is a bit uncomfortable. These sandals are SO cute. But I sent them back because they are SO stiff, I knew they'd end up cutting into my heel and toes. Oh well.